Carlos Julián, cooker master and Chef in the Ampar Restaurant, in the Boutique Hotel Hospes Palau de la Mar, has selected three of his star dishes to taste in autumn. His first amazing and surprising proposal is “Fallen from the tree tangerine with Ampar chocolate”. We are talking about a chocolate Ganache filled with an orange sphere, with anise crumble and orange ice-cream. The traditional ingredients, white chocolate, olive oil, butter, eggs, cream, sugar, saffron crocus, black chocolate, cazalla, beer and orange ice-cream. 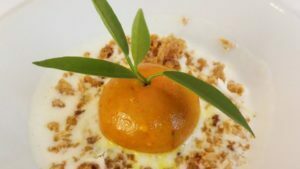 But the big surprise is the appearance of the dish, we are talking about trompe-l’œil of a fallen from the tree tangerine that hides in its inside a chocolate dessert. Without a doubt, an avant-garde and polished technique of Carlos Julián. As a second dish selected by our chef we have “Arrós amb fessols i naps”. We can speak of a delicious rice with seasonal vegetables broth and pork and veal. A very traditional dish from Valencia, especially in this season of the year where the cold remains. By last, you can miss the chance of a traditional and singular “Lamb tournedo with its contrasts”. We are talking about a traditional dish such as a lamb, that it is cooked during 12 hours and accompanied with olives, chamomile, chantarelle, chlorella seed dust that is converted in a traditional dish that is served in Christmas dinner. You can’t miss the creations of Carlos Julián, which kitchen is based in the caring for the product, in taking care of every detail and betting to take advantage of each and every single one of the elements that compose these delicious dishes.